ProgeSOFT SA releases progeCAD 2017 Professional on the brand new engine. ProgeSOFT SA, the leader in low-cost CAD solutions, is excited to announce the next major release of its flagship product, progeCAD 2017 Professional, a 2D/3D DWG/DXF-native general-purpose CAD application, an economic alternative to AutoCAD® and AutoCAD LT®. progeCAD 2017 Professional showcases the brand new IntelliCAD 8 platform delivering far-reaching updates and improvements. In the first place, the new software edition includes a new Windows Ribbon-style user interface offered alternatively to the Classic drop-down menu system and giving the User an option to switch from the traditional to modern GUI appearance with CUI menu files support, adding to more flexibility and the recent AutoCAD® look-and-feel. 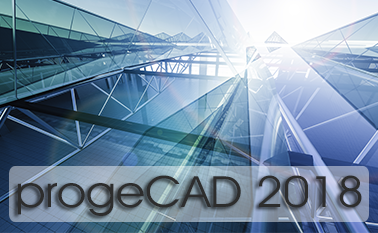 In the second place, progeCAD 2017 evolves to offer the native 64-bit version and multi-core support with improved memory management. Handling of large drawing files gets much more efficient on 64-bit machines, while performance when opening or regenerating progeCAD drawing files has been enhanced by 1.5 – 3 times on multi-core computers. In other words, the program will become way faster, with software overall performance improvement, especially to highlight high-performance when opening/saving/zooming/panning DWG drawing files. POINTCLOUD import made available with progeCAD 2017 will allow the User to work with 3D point clouds, exported from 3D laser scanners. The POINTCLOUD feature contributes to precision and accuracy, giving the exact geometry information of scanned objects and the Operator is able to access every single point and its 3D coordinates. progeCAD will now support Autodesk-similar workspaces, a revamped AUTOCOMPLETE function, activation dialogues, dynamic block handling and overlay support. Significantly improved also existing commands such as LOFT, PURGE and QSELECT as well as DWF printing and DWF/DWFx to DWG conversion. progeCAD 2017 will offer a series of new commands and AutoCAD-2016-compatible variables as well as some other valuable new features too numerous to list here. Click here to watch Video illustrating the new features of progeCAD 2017 Professional. Furthermore, progeCAD 2017 enhances interoperability between progeCAD Professional and Microstation by improving support reading Microstation® DGN files, and enables interoperability between progeCAD Professional and AutoCAD® applications by introducing support for Civil3D, ADT and MDT file formats. Thanks to DGN support and improved Open .dgn, data exchange with Microstation® will become easier in progeCAD 2017 through conversion of .dgn files into .dwg drawings. Finally, AutoCAD® applications compatibility and porting are made much easier thanks to API .NET with user drawing interaction support. As Mr. Damiano Croci, COO at ProgeSOFT SA, commented: “We are taking progeCAD to the next level making it native 64-bit and giving it a fresh Ribbon-look, not forgetting improved performance with multi core computers support. The main ProgeSOFT’s focus is to provide good value for money and progeCAD 2017 Professional is a shining example of that. ProgeSOFT will continue to improve the CAD application based on the demand the company receives globally”. ProgeSOFT invites to download a 30-day fully functional trial version of progeCAD 2017 Professional here. For more information refer to the official website and the dedicated YouTube Channel. Not to miss out on any update, follow us on facebook, twitter, google+ and linkedin.